In the 1960s, IUPAC established the Company Associates program to improve collaboration between the chemical industry and the Union. According to the Union’s Statutes, organizations such as industrial companies, research and development institutions and laboratories, scientific societies, or any other bodies interested in the activities of the Union may become involved with it as Company Associates (CAs). The IUPAC Committee on Chemistry and Industry (COCI) is responsible for developing and maintaining—in collaboration with the National Adhering Organizations—an active program to recruit, guide, and inform CAs on IUPAC programs and policies. To facilitate the recruitment of CAs, COCI has produced a new brochure presenting clearly and succinctly why companies should join IUPAC and the benefits of becoming a CA. According to David Evans, chairman of COCI, it is important to foster the “A” in IUPAC, and COCI contributes to this goal. A copy of the new brochure is enclosed with the mailing of this issue of CI and is available upon request from the IUPAC Secretariat. If you belong to an organization that is eligible to become a CA, you can help IUPAC by informing the relevant department/office in your company or institution. 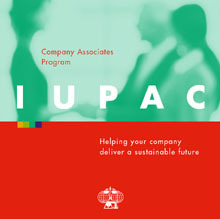 Please review the brochure and see how IUPAC and your company can pair up to deliver a sustainable future. For more information, please contact the IUPAC Secretariat by e-mail <secretariat@iupac.org> or by phone +1 919 485 8700.